Put us on your bathroom wall. Pick up one of our amazing poster prints from any of images from our collection. It makes a bold statement on any wall. 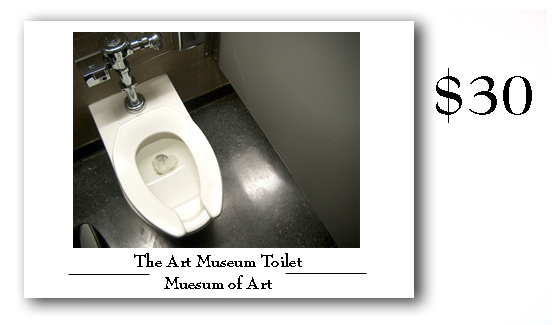 For orders please email info@artmuseumtoilet.org. *For members please take an additional 10 percent off all orders. Offer valid through 1/1/09 for online orders (excluding tax, shipping/handling, and gift wrap charges). Not valid on the purchase of Gift Certificates, Museum Memberships, or on prior purchases. Your purchase helps support The Art Museum Toilet Museum of Art and its programs. Thank you for shopping at the online AMTMA Store.